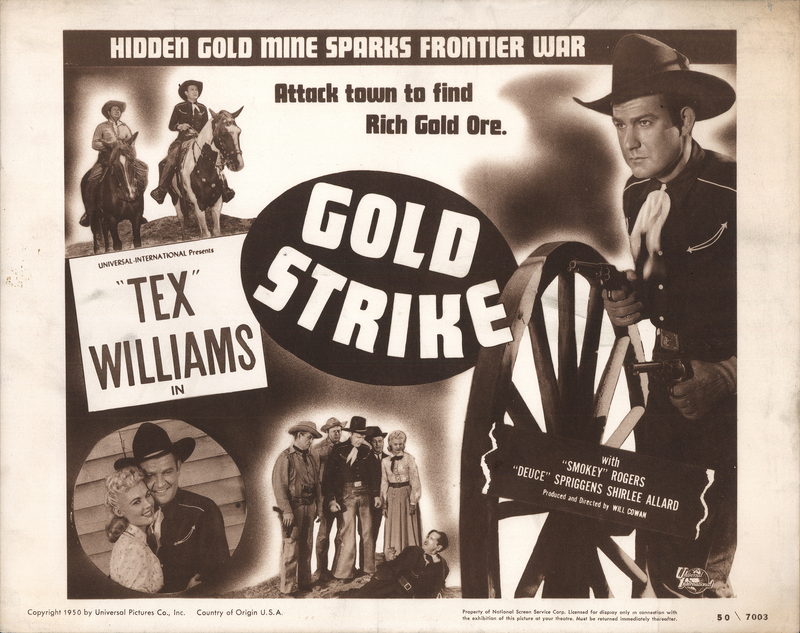 SCVHistory.com LW2827a | Film-Arts | Newhall's Tex Williams Stars in 'Gold Strike' (1950). Eventual Newhall resident Tex Williams stars in the 25-minute short feature, "Gold Strike," from Universal Pictures in 1950. Full original set of four 11x14-inch sepiatone lobby cards. Williams was a popular Western swing bandleader in the 1940s when Universal brought him to Hollywood. Together with his band, Williams made two or three dozen shorts from 1948 to 1950, such as this one. We haven't seen the picture, but the first lobby card probably tells the story: "Hidden gold mine sparks frontier war. Attack town to find rich gold ore." It's unlikely Tex did the attacking. We presume he did the defending, and that he got the bad guys. "Gold Strike" was produced and directed by Will Cowan, and written by Joseph O'Donnell. We don't know where it was filmed. Cast includes Deuce Spriggins, Smokey Rogers, Shirlee Allard, Jack Ingram, Fred Kohler Jr., Robert Anderson and James Linn. "Gold Strike" was released in theaters March 30, 1950. It was later re-released as No. 3 in the series, "Tales of the West." LW2827a: 9600 dpi jpeg from original lobby card purchased 2015 by Leon Worden.